The Good Kind of Crazy: Getting your Kids to love Healthy Food! Getting your Kids to love Healthy Food! My kids LOVE junk. Our Friday "treat nights" are always the highlight of the week. With the exception of a trip to Oma's or baking for company, my kids eat healthy all week. Making homemade shakes is one of the ways we help them love healthy food. I know talking kids into eating their veggies can be tricky, but this is one way your kids will love. I let my kids help make what they've titled "Hulk Shakes". I think you can guess why they've named this drink the "Hulk Shake". When we add blueberries or blackberries they just call it a "Healthy Shake" because the colour is more purple. My husband and I play on the "Hulk" part and remind the kids how great it is for your body to give it nutritious food and how it helps build muscle and stay healthy. My 5yr old wishes it would turn him green, so he drinks the lions share in hopes he will someday drink enough to change colour. Pack as much leafy green as you can into the shake. I usually add 6 cups of spinach to each batch, more if I can get it in! -Adding avocados makes it really creamy. - Frozen berries makes the drink ice cold and almost slushee like. - Chia seeds are a great add-in, and the kids can't detect them in the thick texture. - Bananas are a surefire way to sweeten the shake. - Kale has a ridiculous amount of nutrients you just don't want to miss. If the texture doesn't blend well enough for you, try baby kale! One thing you always need to add is CITRUS! Adding freshly squeezed lemon juice, pineapple or an orange cuts out any bitterness from the leafy greens. If you don't like citrus, don't worry - you can't really taste it, it just hides anything you don't want to taste. Trust me. CITRUS. I added protein to this batch because it's for my husband's lunch that he takes to work. (I blend enough to fill 4-6 mason jars and freeze them) I don't normally add protein to the children's shakes but if you chose to do that be sure to find ones that are safe for 18 & under. 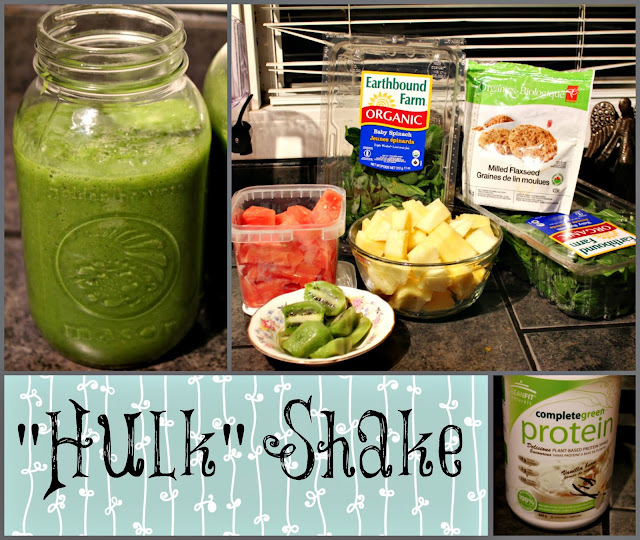 If you have food that is about to turn, just cut it up and put it in the freezer for a shake! Cucumber, watermelon, pineapple, banana, etc. Freeze the fruit or veggies on a cookie tray and transfer to a ziploc bag once frozen. You will feel better about not throwing your money in the garbage and you will have readily available frozen items to make the shake nice and cold. Speaking of freezers, these make GREAT popsicles! You probably have a popsicle tray somewhere in your cupboards - just pour the shake into the forms and freeze. It's a great snack for teething babies, and you can feel good about what they're teething on! Stop fighting with your kids about their veggies and try making shakes with them!